Trespassers on a rain-soaked monument in Wiltshire are causing "spectacular" damage, an archaeologist has warned. 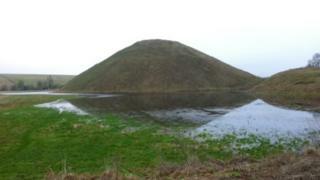 Heavy rain has led to standing water around Silbury Hill in Avebury and very soft ground which is being eroded by people climbing the monument. Jim Leary, an archaeologist for English Heritage, said that illegal climbers on the sodden hill were "leaving some really rather hideous scars". The hill dates back to 2400 BC and is the largest man-made mound in Europe. Mr Leary said access to the mound had been prohibited for a number of decades and people should not be attempting to climb it. "They are going up and it is very wet and they are eroding the side of the hill," he added. "I would really ask people not to go up the hill. It is leaving some really rather hideous scars and eroding our beautiful monument." According to English Heritage, the purpose and significance of Silbury Hill - which is part of the Avebury World Heritage Site - remains unknown. The hill itself is made mostly from chalk and stands 40m (131ft) tall. Recent heavy rain has led to it being almost completely cut off by a moat with surrounding fields also underwater. But Mr Leary said, as far as the monument was concerned, the flood water was nothing to worry about. "It is not a very common phenomenon but it has happened before in 2007 when it was very wet, and also in 2000. "The mound has been there for 4,500 years and I'm sure it will continue to stand despite the weather."